The secret of Chinese porcelain production was finally understood in Germany in 1708 and led to the growth of the European porcelain industry. The discovery of hard-paste porcelain is credited to the mathematician, physicist and physician Ehrenfried Walther von Tschirnhaus. 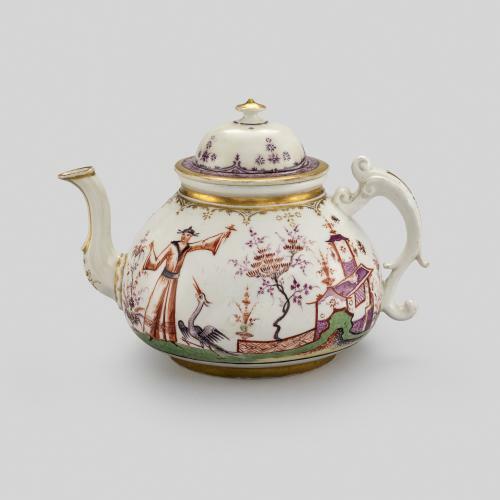 Following his death, the alchemist Johann Friedrich Böttger began producing porcelain at the Meissen porcelain manufactory, where this teapot was created. 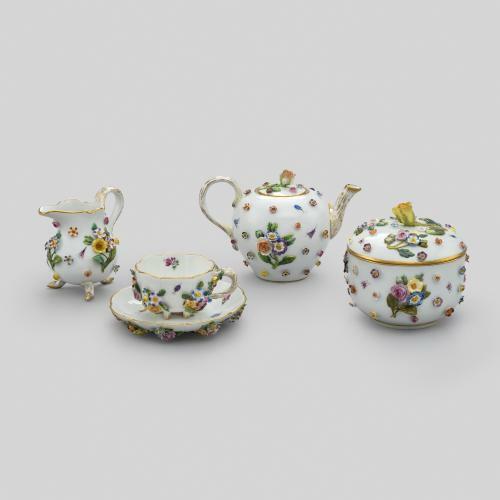 Meissen porcelain was often decorated by Hausmaler, or home painters, who worked at home or in workshops with small kilns. 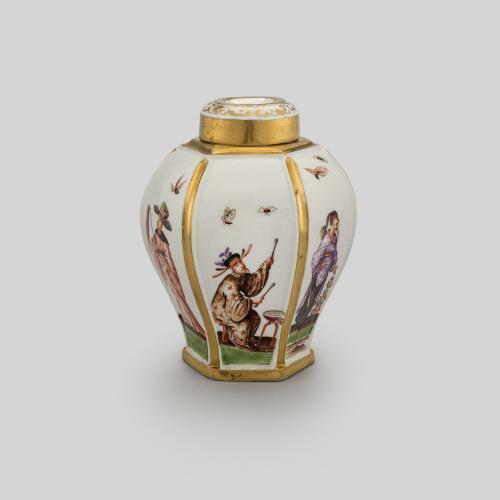 They applied ‘fire paintings’ (coloured enamel decoration) and gilding to white or sometimes sparsely painted earthenware and porcelain which they bought directly from the factory. This globular teapot is probably the work of the hausmaler Sabina Aufenwerth. She was the daughter of the eminent goldsmith and copperplate engraver Johann Aufenwerth (ca.1659-1723). He ran a workshop together with his three daughters Johanna, Anna Elisabeth and Sabina, where Meissen porcelain was painted with gold decoration and coloured scenes. They are the first recorded workshop in Augsburg, which later became a centre for hausmalerei. 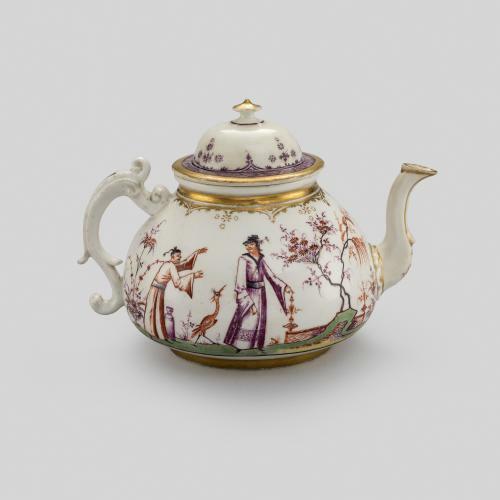 This teapot is decorated with typical chinoiserie scenes, with tall figures standing in garden landscapes surrounded by cherry blossoms and pagodas. Decoration such as this was frequently used on Meissen porcelain, highlighting the fashion for exotic imagery.